The Integrated Farming Systems Project is one of three major projects in the Pasture Systems and Watershed Management Research Unit at University Park, Pennsylvania. The mission of this unit is to conduct research leading to the development of land, water, plant, and animal management systems, which ensure the profitability and sustainability of northeastern grazing and cropping enterprises while maintaining the quality of ground and surface waters. More Sustainable Farms are Needed. Dairy and beef farms are major contributors to the economy of the northeast region. Increasing production costs, static or declining product prices, and environmental issues though, are jeopardizing the longterm sustainability of these farms. More efficient, economical, and environmentally sound production practices are needed. Gaseous Emissions. We are developing process-based relationships that predict the formation, disassociation, and loss of gaseous compounds from animal, feed and manure sources on farms. These are being integrated into a model and software tool for estimating emissions from dairy farms as influenced by animal and manure management. Carbon Sequestration. Carbon sequestration by forage crops is being determined by measuring the net carbon balance in grazed pastures, harvested grassland, and switchgrass fields managed for bioenergy production. 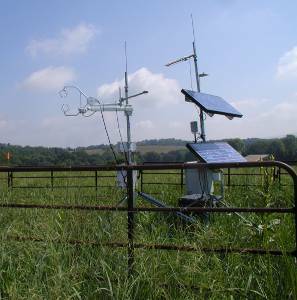 We are developing a remote sensing tool that estimates carbon fluxes from small, rotationally-grazed pastures. Watershed Evaluation. We are refining and validating models that assess the effects of conservation practices on water quality in watersheds. Models are used to determine optimal choices for the selection and placement of conservation practices and to determine model uncertainty associated with watershed environmental impact assessments. Farming Systems. We are refining and using a farm simulation model to evaluate alternative strategies for dairy and beef production. Simulation is used to establish practices that are environmentally sound while maintaining or improving farm profit. Quantify management effects on gaseous emissions from animal, feed, and manure sources on dairy farms. Quantify carbon sequestration potential of temperate grasslands. Validate and use farm and watershed scale models to assess the effects of conservation practices on farm management and our soil and water resources. Over the past few years, we have evaluated a variety of production practices for dairy and beef farms. These studies emphasize the evaluation of management effects on farm performance, environmental impact and economics. Organic Dairy Production. With increasing production costs and a stable or declining real price for milk, smaller dairy farms in the Northeast are having greater difficulty remaining economically viable. Organic production may provide another option for sustaining smaller farms. The organic dairy market has experienced dramatic growth in recent years with a current shortage in milk production. A major deterrent to the adoption of organic production is a three year period required for transition from conventional practices. Considering the growing demand for organic milk and the possible risk in transition, an analysis was done to compare economic and environmental impacts of organic dairy farms to those of conventional dairy farms in this region. Whole-farm simulation was used based upon extensive information gathered from four actual farms in Pennsylvania. Grassland Beef Production. Beef producers must consider management strategies and technologies for reducing potential adverse environment effects of their farms while maintaining or improving profit. One choice is between using perennial grassland or corn as the primary forage source. Perennial grass based production systems are generally regarded as more favorable due to reduced nutrient losses to the environment and potential human health benefits through improvements in meat fatty acid composition. 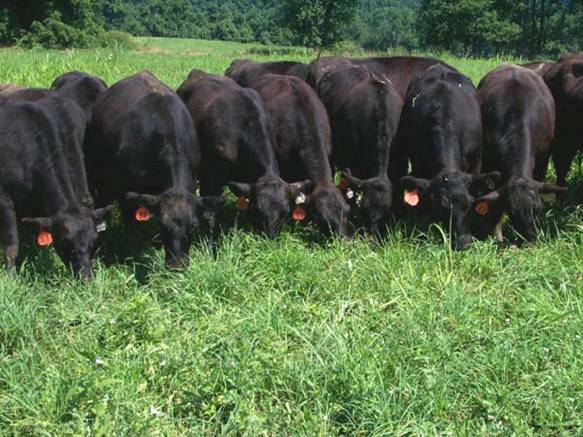 Simulation of an Angus cattle producing farm in northeastern Maryland illustrated that the conversion of the farm from a corn and permanent pasture system to all grassland with more intensive rotational grazing has provided both environmental and economic benefits. Simulated nitrogen loss through ammonia volatilization was increased 16%, but nitrate leaching was reduced 25%, denitrification loss was reduced 50%, and surface runoff loss of P was reduced 75%. This conversion increased the annual net return of the farm by $15,000 by eliminating the greater machinery, fuel, seed, fertilizer, and chemical costs incurred in corn production. Increasing the cutting height in corn silage production was found to not be an economically beneficial strategy for improving forage quality. A conceptual perennial cow production system provided small environmental and economic benefits compared to traditional dairy farms in Pennsylvania. Providing Assistance to Producers and their Advisors. The evaluation of alternative production systems provides information that helps direct and encourage producers, and those consulted by producers, toward management options that improve their farm’s potential impact on the environment while improving profitability. For those interested in analyzing and comparing production systems, a version of the farm simulation model is available from [our home page] (http://ars.usda.gov/naa/pswmru). The model, including an integrated help system and reference manual, can be downloaded and installed on any computer using a Microsoft Windows® operating system.